I'm actually still not sure these are actually them, but I cold stratified a bunch of 2013 collected Iris versicolor seeds, and these grassy things sprouted in spring. I have them in the pond and hopefully, they will grow up to be Flag Iris. They have been tolerant of the cool temperatures and haven't minded the wet feet, so those are good signs. Also, yesterday, I noticed one of the orange goldfish and the fat "minnow" that is definitely not the sleek slate gray and silver shiner but dark brassy black color frolicking among the roots of some uprooted peppermint and elderberry I have temporarily dipped in the shallow parts of the pond to help soak up nitrogen until I get some floating pond plants. The black one that is looking particularly FAT was floating near the surface and then the orange one swam up and sort of slapped at it sideways with its tail fins. Swimming around and repeating. I'm thinking this is spawning behavior? Though with all the shiners stalking every nook and cranny of the pond, I don't really think I will see any babies. In any case, I looked closer at the roots but didn't see anything that looked obviously like eggs. I did find these -- a fake water lily solar fountain and a tiny, solar panel powered DC pump. I still need to see if I can make use of a pump that came with a backyard pool for a gravel filter bog and maybe one or more of DH's old "Powerhead" aquarium pumps. I forgot to mention that I saw some teeny tiny fry in the shallow part of the pond. I guess those goldfish I saw DID get busy. I finally got the plumbing connections I needed for another project, got that assembled and connected my 2nd water pump. plugged it in, but it wasn't pumping. I remembered I tested it before in the 5 gal bucket and it was working then, so unplugged, pulled it out of the pond and put it in the bucket to test it again. Nothing. But when I'd plugged it into the multi-port extension, the tiny air pump for the airlift-pumped turtle spitter lost power. Hmmm... Strange. Unplugged the air pump, plugged in the water pump, and the extension cord started to buzz. Uh oh. THAT sounded like a short. Looked over at the pond and TWO shiners were floating belly up. NO! OH NO! 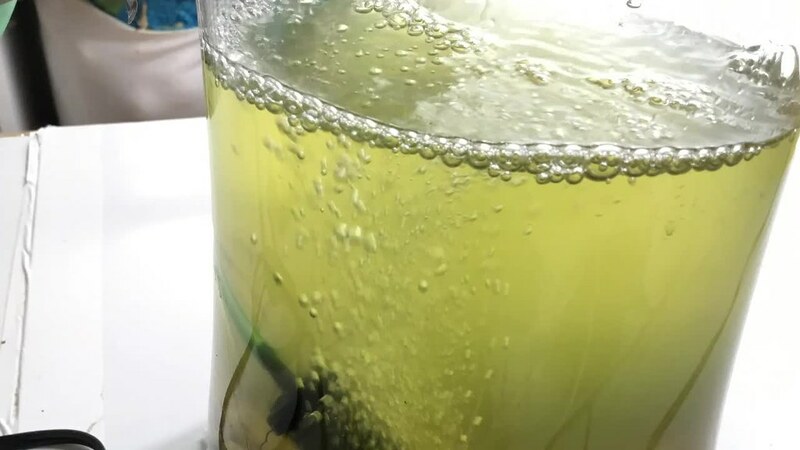 Inside the green 5 gal bucket, little feeder goldfish I just bought yesterday were all floating. Pretty soon two more shiners came floating up, but so far no sign of the goldfish. I dared to hope that somehow there was distance involved in electric shock in the water though that didn't seem likely. ... But 4 hrs later just now, I looked out the window and the orange goldfish was floating and when I went outside, I also found the black goldfish --both had grown up to be full size comet 4-5 inches. And I found the last two shiners I knew about along the edge of the water. I suppose all the fry from their hatched eggs are done for too though I couldn't find any when I tried skimming with the net. Sob sob. No more old unreliable water pumps. Getting a new one. Will have to get more goldfish, too. ...and yes test BEFORE putting in the pond, even if I tested it previously. The pond is looking beautiful though! ...still feeling pretty stupid But having your sympathies helps. Early this morning, I had a wonderful thought while thinking I NEED to get something to control mosquitoes that might start breeding in the pond while the fish is gone... THE FISH IS GONE! -- no fish in the pond -- THAT means.... I could get tadpoles! I got ready to go, and decided I might as well pick up some wood shavings from the furniture maker and started to call them to see if they had some available... Then I remembered it's 4th of July (Happy Independence Day everyone! ) So no wood shavings today , but garden centers wouldn't miss the business opportunity on a long holiday weekend, right? I got in the car at 8:30, then decided to call to make sure before going. Yep, open. ...what the... It's a FROG! Looked EXACTLY like the frogs in the tadpole tub at the store. My inner clown said "BOY! they grow FAST!" * I was also concerned about the water quality since I hadn't replaced the faulty water pump and haven't set up the gravel bog filter, but this frog seems to think its OK.
* Also that my garden's natural balance system IS working -- I tried to intervene and brought in tadpoles but -- there seems to be a force in the works already to fill the niche vacated by the lost fish. Well, I said this one looked exactly like the frogs in the store's tadpole tub, but maybe I'm mistaken because I'm pretty sure they are selling American Bullfrog. 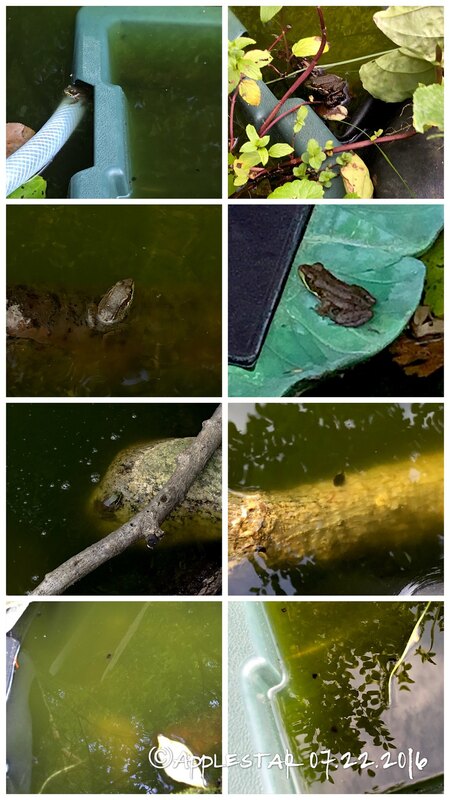 Well, this morning, I spotted 2 more frogs in the pond, and was happy to see that the tadpoles made it and grew up into frogs. I took pictures, of course, and prepared a collage -- all set to post an update. ...then just a little while ago, I realized I forgot to water the relatively newly planted hot peppers along the fence on this hot day (today's high was 96°F) and with several days of heatwave on the way --including one with heat index of 105°F-- felt compelled to go outside and give them enough to tide them over until tomorrow morning, my scheduled rationed watering day, when I can water them properly. On the way back past the pond, I noticed there were FOUR frogs -- yay! All THREE tadpoles! ...then saw a FIFTH -- eh? Most fittingly, I don't have a fancy Koi Pond, not even a Fish Pond ... What I have is a FROG Pond. 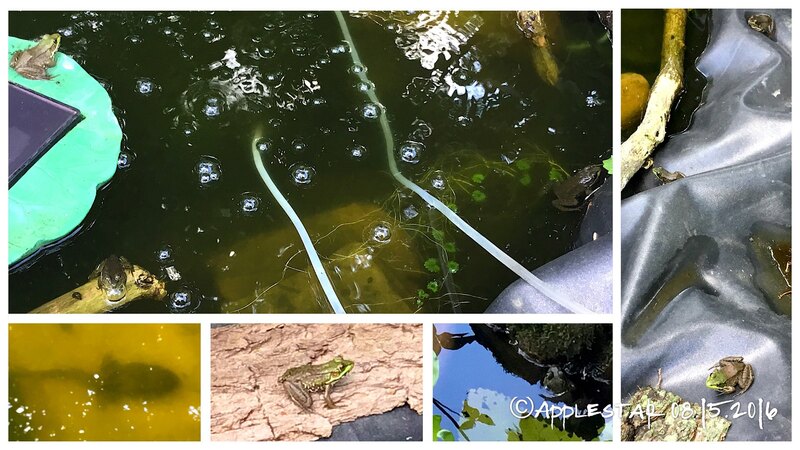 BGM: Music Together: Flute -- "I had a little frog"
BTW -- if your air pump ever stops working, this video is invaluable. In my case, repairing a dinky and ancient AQT 1000, duct tape didn't work. I cut off an excess end flap from a heavyish plastic bag some product of other came in and that worked like a charm. I had plans to put in a frog pond this year. Bought the form, have the site ready for digging, even have the wild frogs waiting to move in. Unfortunately life happened and it will have to wait for things to settle down. So I am so very green with envy about your lovely little frog pond. I'm sorry you lost your fish, especially when they were really making the pond home. But sometimes better things come along. Maybe you'll have toads and dragonflies coming in next. Do you have a Harbor Freight nearby? Sometimes they carry pumps and fountains. I've got a little solar powered fountain in my little tub pond. 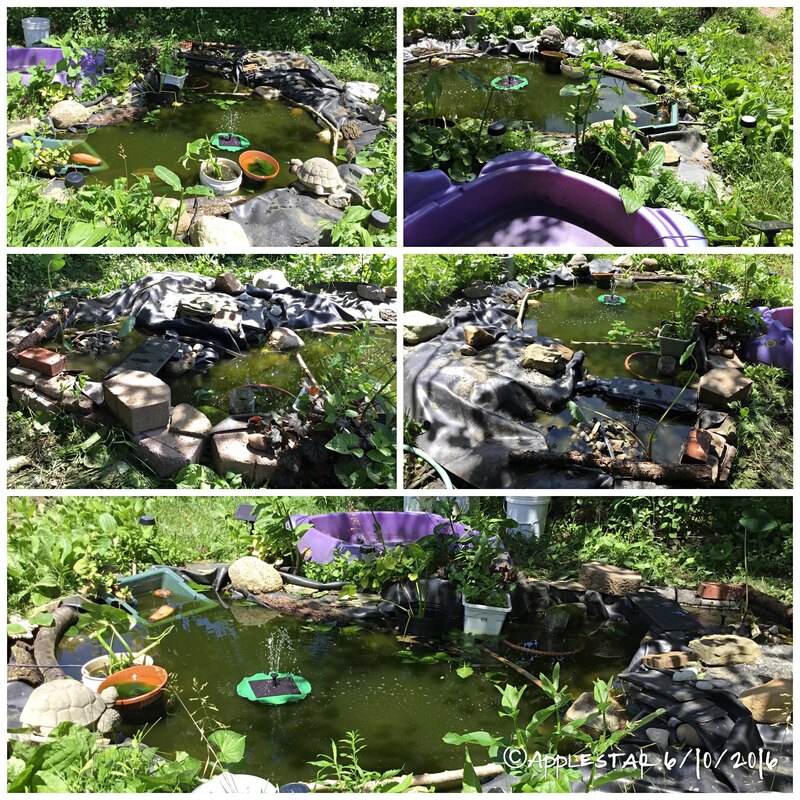 Ok to Use Fishing Pond Water in New Koi Pond? I have a frog in my pond!